Eastern neighbour to the Marlborough region –and friendly rival for sunshine hours– the “top of the South” island is praised for its alternative lifestyle, vineyards, and great outdoors. Two shallow bays, Tasman Bay and Golden Bay, offer a hard-to-match Mediterranean way of life and spectacular scenery with the dramatic northern end of the Alps as a backdrop. The ocean, hills, mountains, lakes, and forests offer a diverse playground for outdoor fanatics. The Golden Bay shores saw the first Māori villages establish in the 13th century. Seasonal fishing, gathering, and horticulture were common to the 300+ settlements. Golden Bay is also the location of the first encounter between Māori and Europeans with Dutch explorer Abel Tasman sailing the area in 1642. Whaling stations, corn and kumara plantations were all established in the region during the 19th century. Settlers from the UK but also Germany created what is now known as Nelson city, with Germans being amongst the first to introduce wine-making to the region. The shallow harbour saw major works undertaken in the 1950s and is now an important and international trading/logistics centre. The wine industry is secondary in size compared to other regions but Nelson has been delivering quality wines domestically and to the world. Coasts, lakes, forests, mountains, and the ocean offer endless outdoors opportunities for locals as well as tourists, such as walking the Heaphy Track, Abel Tasman Track, or kayaking in the bays. But a truly striking aspect of Nelson and Tasman Bay is the rather alternative lifestyle, even by New Zealand standards. The region is not as ethnically diverse as other places in New Zealand, with over 90% of the population having European origins. Long sunshine hours, an extensive coastline, a laid-back way of life, and a particularly thriving arts and crafts community means Nelson is popular with tourists and younger workers alike and the region definitely has a different feel. 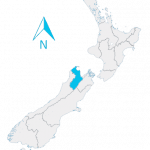 “Sunny Nelson” also boasts the country’s best overall climate with mean averages of 22-24C in summer and 12-14C in winter. Attracting many visitors but also catering for locals, Nelson city has a commendable cafe and restaurant scene. Foodies visit from all over the country to sample the region’s great wines and craft beers. The Nelson – Tasman economy is based on the “big four” industries: horticulture, forestry, tourism (due to outdoor activities and a fast-growing wine industry), and seafood. Nelson is indeed the biggest fishing port in Australasia, but the region also offers minor –but growing– arts and crafts, engineering, and IT opportunities.